I have been having a LOT of trouble with Facebook’s link preview lately, so I wanted to share this tool in case it’s happening to any of my fellow social media marketers out there! 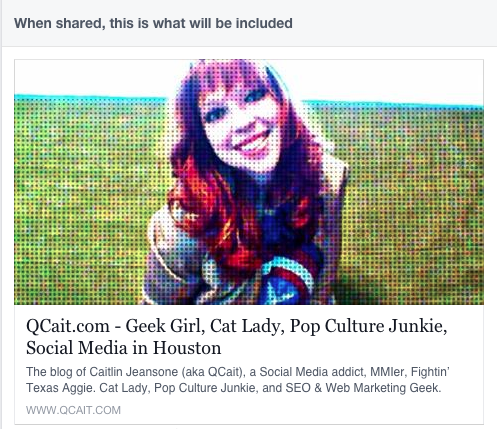 If you have a link you’re sharing on Facebook and the preview image or copy isn’t feeding in correctly, you can run a test to see what information Facebook sees about that URL. I have been using this lately when Facebook isn’t pulling in the information or image I expect, and I’m not sure if that’s just a Facebook glitch or something wrong with the website I’m linking to. If the link preview information looks good in the debugger but weird on Facebook, then it’s probably a Facebook glitch that is hopefully temporary. Often trying a different browser, logging out and back in, or waiting a few minutes will solve the issue. If the link preview looks weird in the debugger, it’s probably a problem with the website itself. If that website is one that you have control over, you or your web developer can likely fix the issue. If it’s a problem with a site someone else built, there’s usually not much you can do. My team uses Sprout Social to schedule content, which typically allows you to customize the preview more easily than natively on Facebook. Note that due to a limitation in Facebook’s API, third party social tools (including Sprout) don’t yet have the ability to tag other Pages in posts. If the link preview information in the debugger is outdated, Facebook may have old information cached. You can go back to the debug tool and click “Fetch new scrape information” to force Facebook to pull the new information. If you do this, it is best to also refresh your Facebook page before trying to post again to make sure Facebook resets. This information is pulled from Facebook open graph data, which can be specifically defined using meta tags with labels that Facebook can read (i.e. “og:description” or “og:image”) that are inserted into the back end of the website. More on og tags protocol here! If this content isn’t specifically defined in the code, Facebook will do its best to grab text and images from the page. Usually it grabs the first few words of copy it can find, and the first image or few images. So if you have control over the website you are linking to, you can make sure the data we want is specifically defined in the back end of the website. Otherwise you are at the mercy of the social media gods. 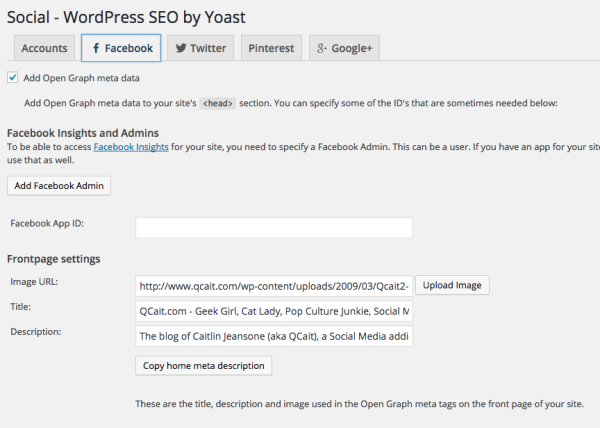 If you have a WordPress site, I recommend WordPress SEO by Yoast, which (among other amazing features) allows you to define the Open Graph meta data for your site (and customize for each blog post) in an extremely easy-to-use form. This plugin adds additional fields to each blog post, where you can define the Facebook sharing Title, Description, and image for that post.